The rumors of the iPod touch getting a camera soon are catching fire everyday. Different sources are convinced that the new iPod touch for sure will get this major refresh this fall. 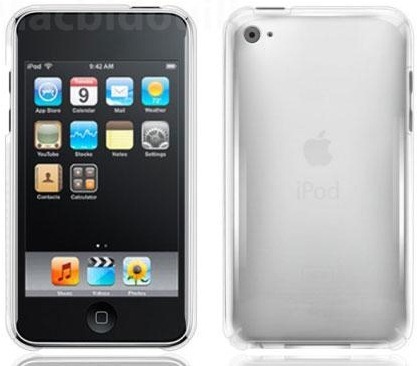 A new illustration of the next-gen iPod touch has just popped up today which shows it in a clear case, along with what appears to be a camera with LED flash on the backside. Computer generated illustrations are easy to come up with, and they only tell you a part of the story. Previously, we’ve seen a number of leaked prototypes of the next gen iPod touch with camera and they all looked a bit different from the illustration which we are looking at right now. The camera was placed in the center of the device rather than on the side as seen in this leaked image. Also, one more thing which this illustration is missing is a front-facing camera for FaceTime calls. I see no “Camera” icon app on the springboard? Was that just a little too hard to photoshop on aswell was it? Ok cool so tell me why this “new” iPod Touch has iOS 2 ? Just so you know, the AppleInsider source is linked to My3G…??? This is fake, completely an totally, No camera app, old OS (look at the calculator app, it's definitely not 4.0) and no black plastic piece on the back for the wifi signal to get through. Please take this down or update it saying this is bogus. I mean, come on really? wer did d wifi reception area goes like ipod 2g and 3g had??? and do all the new ipod touches apparently come with a clear case on it from the factory?